The Pontiff Sulyvahn bestowed a double-slashing sword upon a distant daughter of the formal royal family, ordering her to serve first as a dancer, and then as an outrider knight, the equivalent to exile. 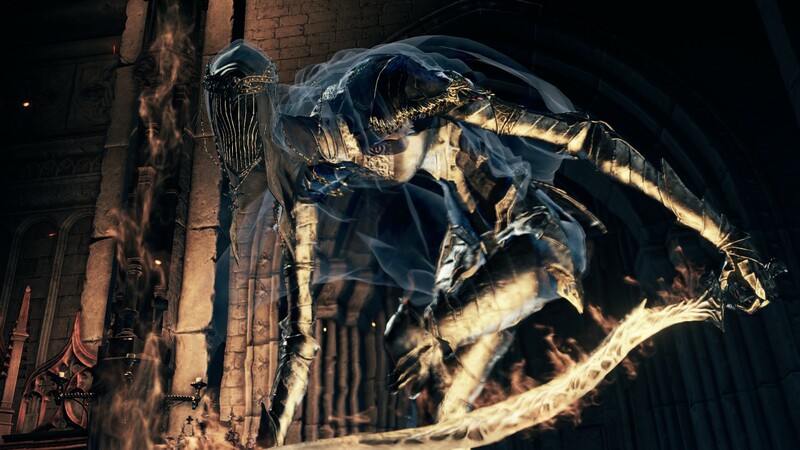 The Dancer can be found opposite Vordt of the Boreal Valley in the High Wall of Lothric. Although you can fight her during your first visit to the high wall, it is not recommended as she is tuned for a higher soul level. Found in the cathedral at the end of the High Wall of Lothric. After killing three Lords of Cinder, Emma will teleport the player to her, giving them the Basin of Vows and the means to summon this boss. * Alternatively, kill Emma and take the basin from her corpse to reach Lothric Castle earlier. Sword Master If you have not yet killed Vordt of the Boreal Valley you can summon the Sword Master if you've defeated him outside Firelink Shrine. A slow sweeping grab with her right hand. Deals an incredible amount of damage. Roll backwards or into the grab, because if you roll sideways away from the grab its slow movement can still catch you. Raises her hand to her face, then presses it into the ground, causing a fiery explosion. Dancer is completely immobile while executing this attack. Sticks her sword into the ground, and drags in in a half-circle. A second later, the line explodes with a matching elemental effect. Most often used to retaliate when attacked from her side. Leaps at distant targets, slamming the ground at causing a quite small fiery explosion. Can be followed up with a sideways sweep attack. Can attack forward targets by swinging upwards with both swords. She usually does not follow up this attack, leaving her open to counterattacks. Spins her swords while walking forward, delivering multiple full circle spins while moving. After a few spins she will stop moving and do another 2 spins very rapidly. Her swords will spin at above head level behind her (until the final spin), giving a bit of leeway with positioning. Numerous combos with swords. Fairly generic but long combos. Be careful for she can deliver a sideways follow up attack after it looks like her combo is over. Can be executed at the end or start of combos. Unlike her slashes, blocking these with a decent shield will interrupt her and leave her open to attack. The columns in the throne room can be used to effectively stop her advances and to make her spin in place during her spin attack in phase 2. By having no lock-on and moving around the column she can be rotated and kept in place for a very long time. However her swords hit through the column so it's best not to hug them. A good way to bait her spin attack is to run between columns on opposite sides, she will try to cover the distance really fast and will spin in one place once she reaches the column. The boss is weak to bleed, so bleed weapons such as katanas, the Morningstar, etc., are very useful during this fight. Since the Dancer can bleed and is weak to it, the miracle Gnaw is extremely useful. The boss is not very aggressive in her advancing; all mage builds should have a fairly easy time regardless. The Dancer's footsteps, unlike other bosses, will make a distinguishable "heart-beat" noise that is in tempo with the boss theme. It is unclear whether the Dancer disrupts its rhythm while attacking, but its footsteps are in sync with the beat of the song while it is circling the player. Weapons with low attack swings (i.e. Greataxe) can be blocked by the Dancer's leg armor, resulting in the rebound animation you get from hitting objects, as well as dealing no damage. Prior to game patch App 1.05 (Regulation 1.08) there was a glitch where you can get the Sword Master to kill the Dancer very easily with bleed and make him invincible. To do this, Vordt of the Boreal Valley had to be alive so you could summon Sword Master. First, you get the Sword Master summon and start the Dancer boss fight by killing Emma and placing the Basin of Vows. The Sword Master should die very quickly. As soon as he is dead, quit and reload the game. you should be outside the bossfog again.